World War II was coming to an end when the Messerschmitt Me 262 first engaged into combat, and it changed the whole game. It was the first jet powered combat plane in history, and although it didn't really change the outcome of the Great War, it definitely marked a turning point in air combat. 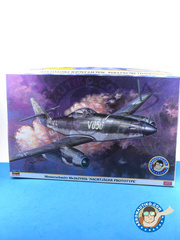 A Hasegawa classic, the Me 262 in 1/32 scale that you can now recreat in 3 different versions. 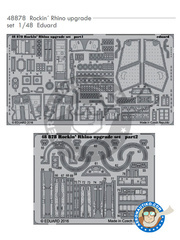 The kit includes the pilot figurine, a fully detailed cockpit, outward engraved paneling and rivets, and all that in five enormously big sprues that you're going to enormously enjoy. 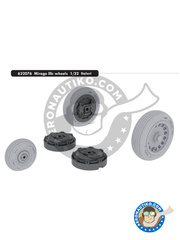 Wheels set made in resin, including photoetched parts, for improving Ju-88 landing gear. 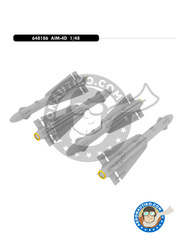 Set of Brassin resins by Eduard for replacing wheels and rims on Italeri Mirage III landing gear. 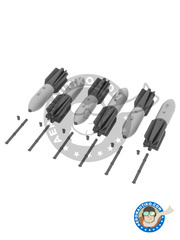 Set of six bombs with airbrakes in 1/72 scale, featuring 30 resin made parts and one decal sheet. 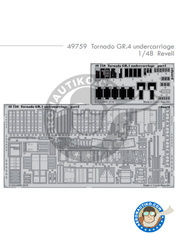 Photoetched parts set for complementing the very impressive Eduard or Academy kit of the Phantom II version J.
Photoetched parts set for improving the outer looks on Revel Tornado, also including photoetched parts for the turbine. 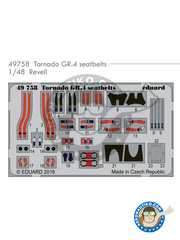 Set by Eduard full color printed photoetched parts featuring seatbelts for enhancing cockpit detailing on Revell Panavia Tornado scale model kit. 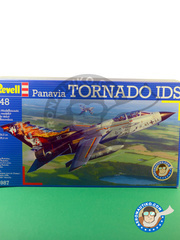 Set by Eduard of two photoetched parts sheets, one of them fully color printed, for detailing landing gear bays on the Panavia Tornado by Revell. 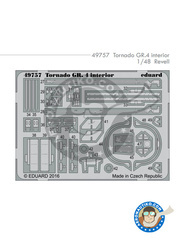 Set by Eduard of two photoetched parts sheets for detailing Revell Panavia Tornado cockpit. One of them is raw, while the other is fully color printed. 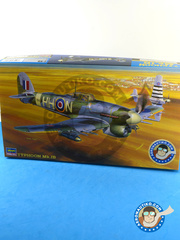 A new edition of Hasegawa classic Hawker Typhoon in its B version, including decals for recreating two different decorations operating in 175 and 198 squadrons of the Royal Air Force. 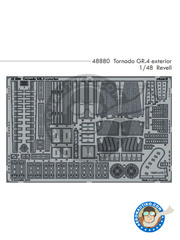 A magnificent GWH kit in a special edition, including inside the box a pile of hyper detailed plastic parts, new and improved photoetched parts, decals sheets, paint masks for the clear parts, color references from Mr. Hobby and Vallejo catalogues, ... The included decorations belongs to the "Anonymous III" and "Lady in the Dark" units at Iwo Jima in 1945. 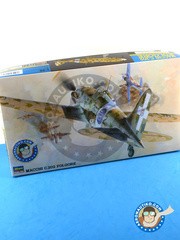 A gorgeous Fw 190 version by Hasegawa. 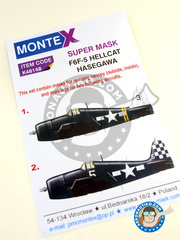 The kit includes a small photoetched parts sheet, a good pile of parts, and an extensive decals sheet. 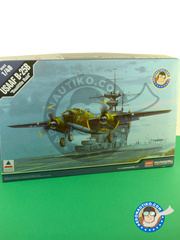 In addition, the kit also includes a BT700 torpedo. 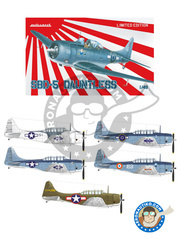 Mask based decorations for recreating the USAF embarked units at the USS Santee and USS Independence on 1945. 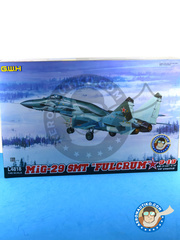 A new and incredible MiG-29 scale model, an absolutely spectacular kit featuring astonishing details levels and awesome finishings. 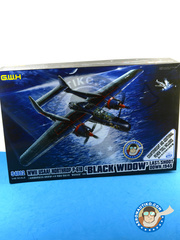 The box includes an exhaustive decals sheet, missiles sets injected in one piece, photoetches parts, .... Have you ever seen anything like this? 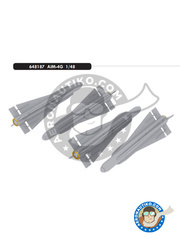 Set of AIM-4 Falcon missiles made in resin, includo a small photoetched parts sheet for detailing. 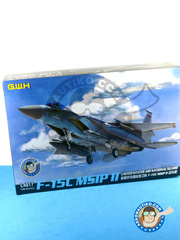 An impressive kit, released in collaboration with Accurate Miniatures, including Cartograf printed decals, paint masks, colored photoetched parts for the cockpit, resin parts, ... A mind blowing scale model! !, but pay attention: it also is a limited edition!! 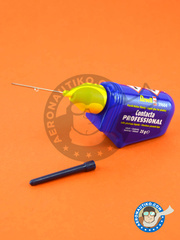 Professional contact glue specifically formulated for putting together the plastic parts of your kits. 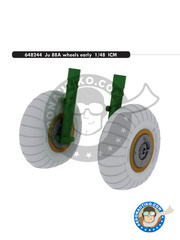 It dries in a few seconds and can be easily applied thanks to the dispensing needle. Includes 25 grams of glue. 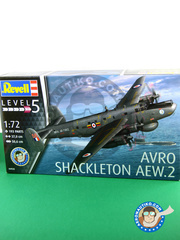 With nothing less than 193 parts, here is the gorgeous Avro 696 Shackleton in 1/72 scale by Revell. A fully blown parts break up, an extensive decals sheet, and delicious building instructions that will be really handy to finish your enormous project. Make a really big hole in your shelf!! 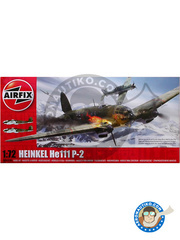 A great-looking Airfix kit of one of the most gorgeous German flying machines of the World War II, including a detailed parts break up of the flaps and ailerons, landing gear and crew areas. 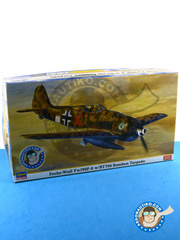 Also includes decals for reproducing two different Luftwaffe units operating in 1940.